A Resourceful Home .com: 30 Pounds of Blueberries! 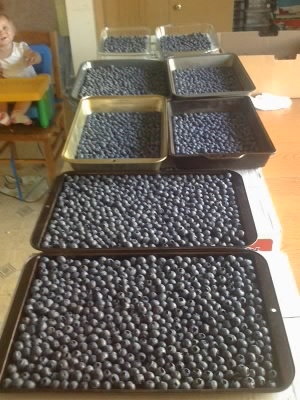 I bought 30 pounds of blueberries last week because they were only $2.00/lb and we love blueberries. I froze them in 10 pound batches on cookie sheets and in cake pans. Here's a shot of the first 10 pounds. 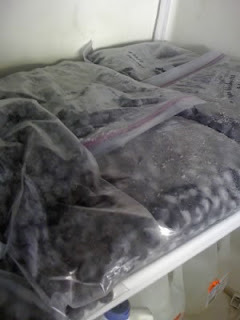 When they were frozen I dumped them into ziploc bags. In total I had 90 cups of blueberries! Here's what one shelf in my freezer looks like. Oh, the joys of bulk food: A lot of work to store, so worth it for the price.